Having completed their rite of passage known as the “Leap for Success” back at the beginning of May, I know find myself becoming more proficient in their regular activity of “water sports instructing.” From May onwards, myself and fellow Leapers, “Short shorts” (Pete C) and “Cinna-buns” (Jaz) have mainly been working with fellow off-worlders from schools. 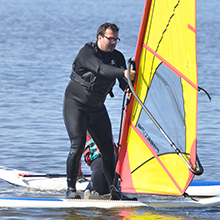 Our work has mainly involved doing taster type sessions in sailing, windsurfing and paddle sports. During mini-voyages around Poole Harbour I have found myself in the trusty Wayfarer boat transporting small off-worlders to Ham Park for lunch and adventures. In the evenings we entertained the young off-worlders in with sessions such as archery, crabbing, sand sculptures and films. Near enough every group I have worked with has been great but I most enjoyed my time with the groups from the system Baydon Primary and the nebula British School of Netherlands (BSN). Both groups had lively personalities and a love for adventure. With BSN, wise woman of Rockley Liz, gave me responsibility for an even entertainment group who were fantastic and we had many laughs creating a tribute to a famous vine that used the song All Around the World ( La La La La) by ATC. It has to be seen to be believed. Being proficient in the dark arts of paddling, I have found myself mainly on these sessions with the school groups. 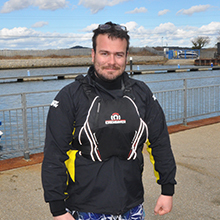 Whilst I normally like to share my passion for paddling in paddle crafts, I have become more aware of the advantages of using a powerboat to transports paddlers on sessions to more exotic places around Poole Harbour. More recently we have been delivering RYA courses to small and grown-up off-worlders who wish to gain certification for their own skills. 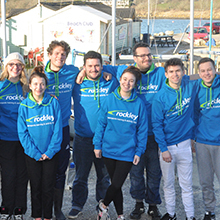 I have particularly enjoyed delivering the Level 1 Start Sailing course to adults because it is in boat tuition and working with a small group of no more than three for two intensively. This allows you to really improve the off-worlders skills and it matches my current ability nicely. I am the king of Beam Reaching! Apart from courses, with the temperature rising many people called “holidaymakers” and “members of the public” have begun to flock to planet Rockley in beach attire. They have sought to hire out equipment to try water sports such as power boat driving, stand up paddle boarding and kayaking. It has been my job in many away missions to facilitate this hiring by taking payment, providing supervision, equipment and buoyancy aids. When Beach hire is quiet I too have enjoyed the rays from planet Rockley’s sun. Having previously split my time between land and water sessions, I have found myself becoming quite tired after repeated full days on the water. That said it has done wonders for my tan, beach bum hair cut (it’s long and lighter) and shoulders. The Rockley team have been graciously accepting of my strange ways and the younger Rockley team members have even brought along on social nights out to the strange and busy places of Bournemouth and Poole Quay to enjoy a strange beverage called a Jager bomb, pronounced yay-gur. It’s a strange drink but has been known to bring about euphoria in those that ingest it. Being an adventurer, I have thoroughly enjoyed my on-going career break that has allowed me to visit Planet Rockley. As for the future, who knows what that will bring as I like to take each adventure one at a time. My next away mission will be to the French quadrant of the Rockley space system for three weeks where I will unite with my Leaper, comrade and fellow scoundrel, Sam. Thanks again to wise woman, Liz, and planet Rockley people organiser, Kat, for the opportunity for the mission. One to beam up. Cookie out. 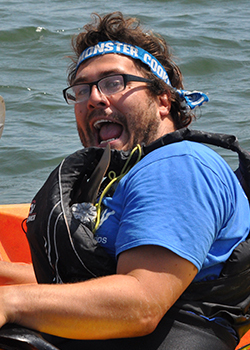 As Stephen and his fellow 2018 Leapers rise to the challenge of Dinghy Instructor Week, here he explains how they all got on.